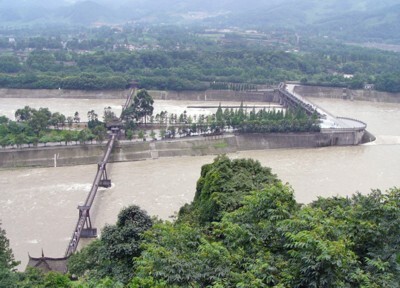 Construction of the Dujiangyan irrigation system began in the 3rd century B.C. The irrigation system was erected on the Minjiang River at the foot of Yulei Mountain, northwest of Dujiangyan City in Sichuan Province. Here the Minjiang River, after being joined by many tributaries in its upper reaches, runs toward the Chengdu Plain.